Hello once again fellow scrappers! It's time for another reveal over at Once Upon A...Sketch (OUAS). This month's theme is: Season (Summer, Autumn, Winter, Spring). For me this was a no-brainer. I've been an Autumn fan my whole life. I love the colors that come with Autumn, the changing of the leaves, the crisp mornings, the immaculate blue skies. It's Mother Nature at her best. I know many people love Summer--but for me Summer here in the North East is just too humid for comfort. I don't mind hot--but when you add humidity into the mix--that's when you lose me! In addition, I was married in the Autumn and this is what this page represents. This is me & my hubby almost five years ago celebrating our first year wedding anniversary. We went away to a Bed & Breakfast when the foliage was at it's most colorful. I incorporated as much of the colors that I witnessed on this getaway as I could on this page. It was a mixture of burgundy, browns, golds, yellows, oranges and just a hint of green. The turquoise splashes here & there represent the blue skies--which in October the sky is usually as blue as it can get! Here's the sketch provided by Nadia that is to be used for this challenge. 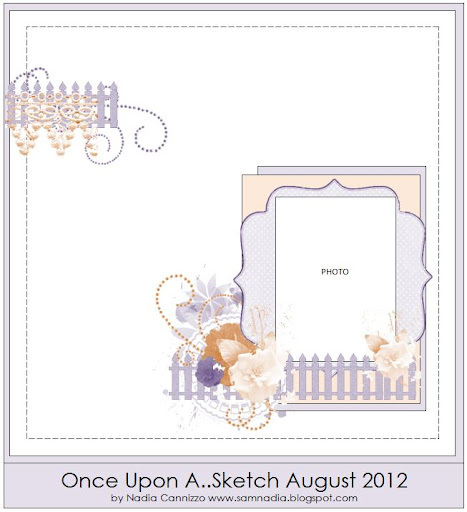 The background is paper from Tim Holtz's Kraft Resist Cardstock. I added a hint of turquoise to it by randomly inking it with Tumbled Glass distress ink. 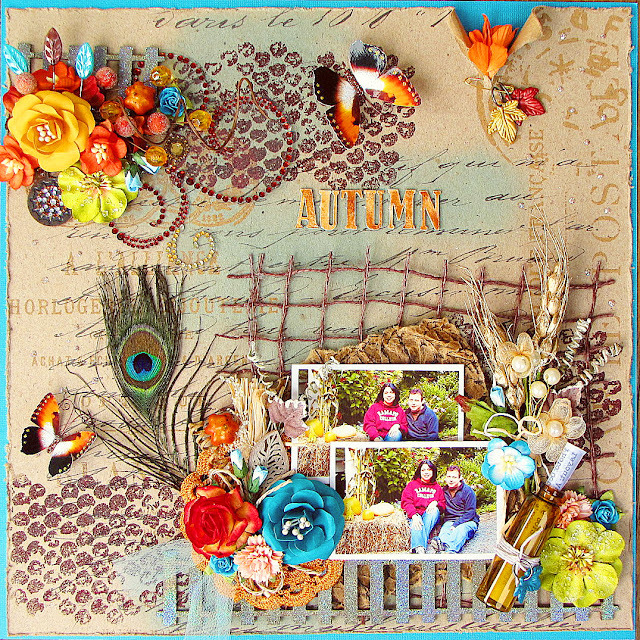 The chipboard title & fence are by Imaginarium Designs. For the fence I kept it simple. I simply inked it with embossing ink & then heat embossed it with Kaleidoscope embossing powder by Stampendous. In person, this gives off such a shimmery effect. I tried to capture it as best as I could here. I finally got to use a peacock feather I've had in my stash for ages! These butterflies will soon be the latest addition to my Etsy shop. They were the perfect finishing touch to this page. In the background I also randomly stamped the 'Bubble Wrap' stamp by Donna Salazar with Aged Mahogany Distress Embossing powder. Once embossed, I scratched off a bit of the powder with my finger in order to give it a more shimmery effect. A close up of one of my clusters. This is a mixture of Prima flowers, mulberry flowers from my stash, handmade flowers and beads, pins & trinkets from my own stash. A Prima crystal flourish is in the background. My other lil' cluster. Once again this is composed of a handmade flower, mulberry flowers from my stash and other trinkets from my stash. In the bottom is a bright orange crochet doily and I tucked a bit of light turquoise tulle in the bottom as well. To give the title some shimmer & texture it was first painted with gesso--then spritzed with the following: Pralines & Cream Smooch, Cashmere Smooch & Terra Cotta Spritz by Shimmerz. It was then heat embossed in order to have all those mists soak into the chipboard. Finally I gave it a coat of Glossy Accents. I once again stored my journaling inside a brown glass vial. I wrapped a bit of twine around it & adhered a leaf charm to it. Thanks to all of you who stop by for a visit--do take the time to visit the OUAS blog and check out the other talented DT's take on this challenge and to play along! Beyond stunning, beautiful, and perfect!!! Kay you did an amazing layout, Love all the fabby details in your page. I especially like the blue accents and the mesh like fibers. You 2 look like kids! Very nice. Such great autumn colours in your page...love it! I also love autumn and I miss it so very much - here in Africa we don't have in the way it is in the northern parts of the world. but your autumn is so bright and happy and full of the prettiest colors! your LO is breath taking! amazing work! Gorgeous layout Kay! Love the mix of vibrant colors! It's very very beautiful work! The journa is great idea. Thanks for your sweet comments on my OUAS layout. Yours is gorgeous--I love the interplay between the turquoise tones and the reddish-orange tones...autumnal indeed!